The Orange County Go Club’s Kevin Chao 6D (right) prevailed in a spirited bidding war at the annual go board auction at the 2015 U.S. Go Congress banquet August 8. For much of the auction, conducted by E-Journal Managing Editor Chris Garlock and American Go Foundation president Terry Benson, it was a 3-man duel between Brady Daniels, Congress Director Josh Larson and an increasingly hoarse banquet MC Andrew Jackson. 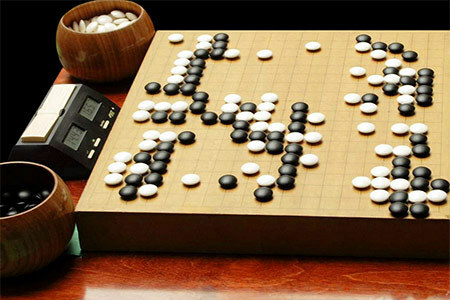 The back of the board — donated by Yutopian — had been signed by most of the professional go players attending the Go Congress, and previous winner Andy Okun testified to the veracity of Garlock’s promise of improvement, noting that he’d been 1-kyu when he won the auction and is now shodan.